Task 4. Read the passage and do the given tasks. One method of heating a building is to circulate hot water through radiators which are located in each room. The water is heated in a boiler by a burner and is kept at a constant temperature by a thermostat device called an aquastat. The aquastat is located on the outlet pipe from the boiler. The pipe runs in a continuous loop from the boiler to the radiators and back to the boiler. 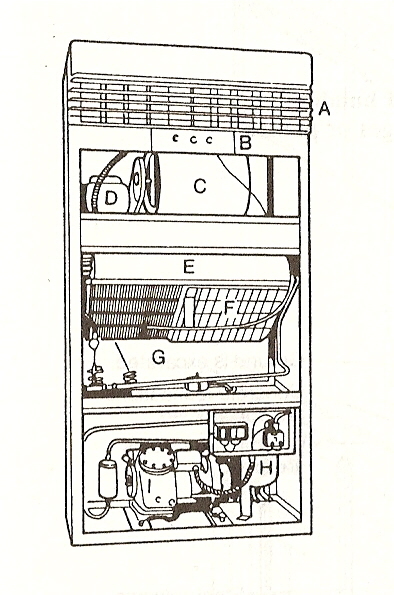 The function of a radiator is to transfer the heat from the hot water to the air in the room. Therefore they are made of a material which has the property of high thermal conductivity. The shape of the radiator is also important because the greater the surface area the more rapidly it gives off heat. One type of radiator, called a fin tube, consists of a number of thin fins shaped like a circle which are welded to a pipe passing through their centres. A thermostat in the room can be set to the required temperature. When the air temperature in the room decreases, the thermostat switches on the pump which is located on the return line from the radiators. When the room reaches the set temperature, the thermo­stat switches off the pump. An expansion tank is provided to allow for expansion of the water as it heats. A safety valve, located on the pipe leading to this tank, serves to relieve the pressure in the boiler if it is too high. a) What enables the inside of a building to be kept warm? b) Which part of the heating system circulates hot water through the continuous pipe? c) Which part acts as the room temperature controller? d) Which part functions as a means of controlling the temperature of the water in the boiler? the air in the room? f) Which part prevents the boiler from blowing up? 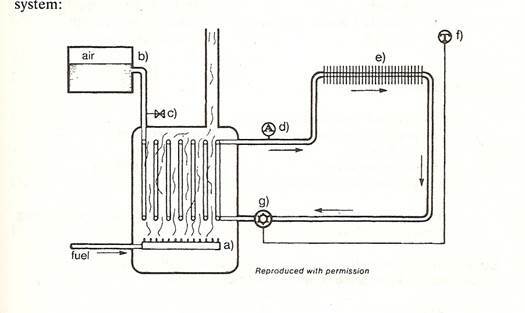 g) Which part serves as a device for heating the water in the boiler? h) Which part enables the water to expand safely? a)When the pump is switched on 1. the aquastat shuts down the burner. b)When the temperature of the water in the boiler de­creases 2. the safety valve relieves the pressure. c)When the temperature of the water in the boiler reaches the set temperature 3. the thermostat switches on the burner. g)When the boiler pressure is too high 7. hot water flows through the pipe to the radiators. Air conditioners are designed so they are capable of performing some or all of the above functions. Example: In an auditorium, the three most important functions of an air conditioner are to control the temperature, to remove odour and to control noise. STUDENT: What is the function of the air filters? STUDENT: SO that's why it's dirty. STUDENT: What does that do? STUDENT: Where the liquid evaporates. STUDENT: Absorbs heat from the air. LECTURER: Yes. Now keep quiet will you and don't touch that. STUDENT: What is the evaporator made up of?